Black women are particularly vulnerable to the effects of European standards of beauty, because these standards emphasize skin colors and hair types that exclude many black women, especially those of darker skin. 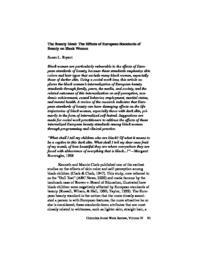 Using a social work lens, this article explores the black woman’s internalization of European beauty standards through family, peers, the media, and society, and the related outcomes of this internalization on self-perception, academic achievement, sexual behavior, employment, marital status, and mental health. A review of the research indicates that European standards of beauty can have damaging effects on the life trajectories of black women, especially those with dark skin, primarily in the form of internalized self-hatred. Suggestions are made for social work practitioners to address the effects of these internalized European beauty standards among black women through programming and clinical practice.